Serena Buschi creates paper works, paintings and installations that reflect aspects of identity formation. These refer to community, scientific constructs, religion and culture. Herself, a product of two cultures and varied traditions, she embeds her paper full of scars, marks, vibrant color and imagery that are reflective of her own identity, expressing the layered experience of her amalgamation. Her use of thread is a constant within her work and serves as a reflection of generations past and present and their histories pieced together into a new context, a new assemblage of many parts. Her work is reminicent of geodic and sedimentary rock as the formation of these parallel the documentation of collected time and experience. Her background in fashion design is reflected in her work as it manifests as quilted and layered formations. 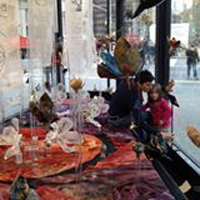 She uses encaustic, paper, fabric and thread in many of her pieces. 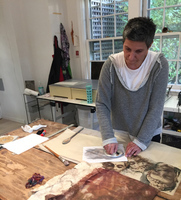 Buschi holds a MA in Art and Art Education from Teachers College Columbia University and has studied extensively with mentors in painting, encaustic and cold wax. 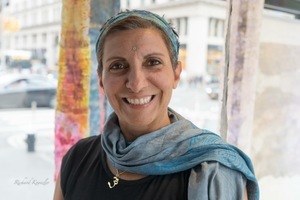 Her work is in many private collections and she has recently exhibited in the Flatiron Prow Art Space, New York. She is currently represented by Cheryl McGinnis Projects, NYC.